The 227 kilometer mountain road, built almost parallel to the continental divide, passes through Banff National Park and Jasper National park. Named after the Columbia Icefield and the numerous other glaciers found along the route, Icefields parkway is also known as Highway 93 (Alberta 93). From TransCanada/Highway 93 interchange, the first 122 kilometers of the Icefields parkway passes through Banff National Park and the rest of the parkway through Jasper National Park. The parkway completed in 1940, winds through rugged mountains, glaciers, river valleys and pristine alpine lakes. It is one of the best scenic routes in Canadian Rockies. What to do in Icefields Parkway? Enjoy the sheer beauty of the mountain scenery with river valleys, snow capped rugged peaks, rivers and creeks. Picnic at the many scenic spots found along the parkway. Go for hikes and experience the forested river valleys and glacial lakes. Discover Columbia Icefield on your own or with Brewster Glacier Adventure. Go for Glacial skywalk. See the wildlife like bighorn sheep,black bear, caribou, elk, moose, mountain goats, grizzly bears, and wolf. Bike along the route from Banff to Jasper enjoying the magnificent landscapes. Fishing along Icefields Parkway : National parks fishing license required. Hector Lake, Chephren Lake , Cirque Lake ,Mosquito Creek, North Saskatchewan River, Peyto Lake, Waterfowl Lakes, Valley of five Lakes, Athabasca river, Hardisty Creek, Beauty Creek, Sunwapta river & Whirlpool river are some of the fishing spots along Icefields parkway. See Alberta fishing guide for bait bans, season and other regulations. Snow shoe along many trails, ice climb at the weeping wall and cross country ski in winter. Description of sights, attractions, lakes, waterfalls and glaciers along the Icefields parkway. Must see spots highlighted in bold. Icefields Parkway Map – Points of Interest. Use street view, near the points of interest to preview the views along roadside pullout points. Stop at this viewpoint to see Herbert Lake, formed by glaciers during ice age, backdropped by Waputik range and Mount Temple. Enjoy the beauty of this turquoise green Lake, which is the largest natural lake in Banff National Park. The lake is in the valley formed by Crowfoot Mountain of Waputik range. For the next two kilometers, you will be traveling almost parallel to the lake, with glimpses of the Lake through the trees. Appreciate the this glacier,on the Crowfoot mountain. Crowfoot glacier was shaped like 3 toes of a crow, clinging to the side of the steep mountain when it was named in the early 1900s. Due to climate change, the toes have melted and now it barely reaches over the cliff edge. Revel in the pristine beauty of Bow Lake , which was created by retreating glaciers. Enjoy a picnic at the day use area and treat yourselves with the view presented by with snow capped mountain peaks reflected in the Bow lake. Park at the parking lot (turn off at left side as you travel north towards Jasper), and hike the paved road to Peyto lake, named for Bill Peyto. 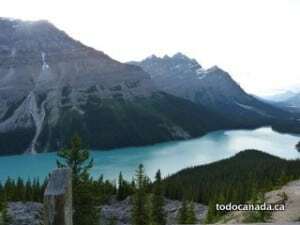 Donot forget to hike up the paved short road to the Peyto Lake viewpoint. Enjoy this stunning view of the lake with its amazing green hue which changes according to seasons. Click on the link for more information about the lake. Snowbird glacier is on Mt Patterson across the Mistaya Lake. At the pullout, the view of the glacier is partially obstructed by the trees. Park at the pullout, and walk the short trail on the northern end of the pullout to the Waterfowl Lake. Mt Chephren and Mt Howse is in the background of the lake. Trails around Waterfowl lakes provide good opportunity to view wildlife. Continuing from the first pullout, one reaches the scenic drive along the Upper Waterfowl lake . Stop at the view and appreciate the exhilarating scenery. Just before reaching the David Thompson Highway (Highway 11), almost a kilometre after the bridge over Saskatchewan River crossing, stop for the beautiful view of Howse and Mistaya River joining the North Saskatchewan River with Mount Outram & Mount Forbes in the background. Enjoy the view of North Saskatchewan River Valley framed by Mount Amery & Mount Saskatchewan. Stop at this pull out to see a series of small streams of water, tumbling 300 ft down the steep slopes of Cirrus Mountain. Lower weeping wall is an ice climbing spot in winter. The viewpoint after the bigbend, shows view to the valley with North Saskatchewan River on one side and Cirrus Mountain on the other. A plaque points to the thin white water fall tumbling down the steep mountain face across the valley at this pullout. 5 kms after the boundary demarcating the Jasper and Banff park boundaries, one will reach the Columbia Icefield Discovery Centre on the right and the trail to Columbia Icefield (Athabasca glacier) to the the right. Hike up the trail to the toe of the glacier. Explore the glacier gallery in the Icefield centre. Replenish at the Columbia Cafe or the Glacier dining room. The newest attraction, Glacier Skywalk, is situated near Columbia Icefield. Panoramic view of the Sunwapta Canyon. One can also see the accumulation of glacial debris left by Dome Glacier. Viewpoint for the waterfall that cascades down the rocky cliffs of Tangle ridge. Keep the eye open for this falls, as you may miss it, when traveling north to Jasper. Ice climbing spot in winter. View of the Stuttfield Glacier (named after Hugh Stutfield, explorer ), clinging to the majestic Stuttfield mountain, can be seen above the trees. The valley, near the pullout, is filled with glacial accumulation left behind by the glacier. 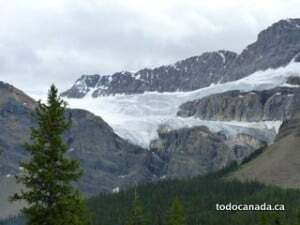 From Stuttfield glacier lookout, the icefield parkway travels parallel to Sunwapta river and along the way there is a pullout for Beauty Creek trail head. Diadem peak and Mushroom peak pullout is about 3 kms from Beauty creek pullout. Situated in the Sunwapta River Valley, Mushroom & Diadem peaks can be seen towering over the trees. Endless chain range is seen on the North. 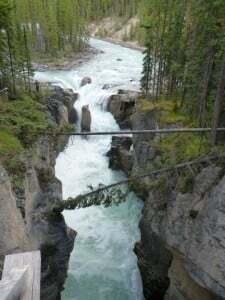 The Sunwapta river which ran parallel to the parkway, tumbles down into a deep canyon. Walk along the trail and appreciate the beauty of the falls. Cross the bridge and see the falls at its best. Ice climbing spot in winter. Click on title for more details. Located in Athabasca river valley, Mount Fryatt is one of the highest peaks in Alberta. The rugged pyramid shaped peak, named after Captain Charles Fryatt, can be seen to the south of the pullout. Also known as ‘Mineral Lick’, this lookout point offers views of mountain goats on Mount Kerkeslin and river bank filled with glacial deposits in the foreground. The goats can be seen grazing along the mineral deposits searching for glacial salts. The wide Athabasca river travels through a narrow gorge forcing large quantities of water to fall over hard quartzite ridges to form the 23 m picturesque waterfall. Pullout view point with plaques pointing to the majestic peaks of Mount Hardisty, Mount Edith Cavell and Athabasca pass. You may be interested in Attractions in Banff National Park. When to go to Icefields Parkway? No road maintenance from November to April | 3:30 pm to 7:00 am. Check road conditions from AMA. Phone : Banff : 403-762-1450 & Jasper : 780-852-3311. Parks Canada winter advisory brochure– here. Make sure that the gas tank is full, and you should be prepared for the real winter driving. Vehicles should be equipped with winter tires and emergency gear. Icefields parkway will be closed only due to heavy winter storm and other weather related issues like mudslides & flooding. Columbia Icefields Centre is closed during winter (mid October to mid April). How much does it cost to drive through Icefields Parkway? Included in Banff/Jasper National Park admission. Adult: $ 9.80; Senior: $ 8.30; Youth: $ 4.90. How long will it take to drive Icefields Parkway? 3.5 hours without stopping to a full day, with stops to enjoy the scenery and do few hikes. For cycling , try to allocate 7 days and travel from Banff to Jasper, as Jasper is at a lower elevation (~ 500 m) than Banff. Sundog tours offers Icefield Parkway tours, ( 4 person minimum required ) with a total duration of 6-12 hours. * Verify all rates, operating hours from Parks Canada Website. Two separate campgrounds for RVs & tents. RV campground at Icefield centre has around 100 sites and Tent sites around 33. 781 sites with firewood, cooking shelters, electrical hookups (126), hot showers, flush toilets and play ground for kids.Accommodates RVs & motor homes. Fees : $22.50 to $38.20 depending on the Campsite. Accessibilty : There are two paved sites, each with adapted picnic tables and fireboxes. Wheelchair-accessible showers available. Closed every Thursday from October 01, 2016 to April 27, 2017. Closed April 17, 2017 - May 5, 2017 inclusive. Everyday from May 1 to September 30. Everyday from May 1 to September 30 2017. About 25 rooms. Coffee shop & Dining room. About 66 rooms. Cafe,Dining Rooms, & Pub. General store & motor service station. About 52 rooms. Restaurant & Deli. Operating Season:Early May to Early October. 4. Glacier View Inn: Located in the second floor of Columbia Icefields Centre. Operating Season: Mid April to Mid October. Single log cabins to family chalets. Restaurant. Picnic Sites at Bow Lake, Coleman Creek, Mount Christie, Bubbling Springs, Athabasca falls. Gas station and general store at Crossing Resort located at David Thompson highway junction. (Fill up here,if required, as there is none till Jasper). Wash rooms /Restrooms/ Dry toilets available en-route. While hiking in the North Saskatchewan and Saskatchewan Glacier area we stumbled upon an old paved road with what looked to be a road to somewhere now abandoned complete with old vehicles, old Spork cans and other detritus from a long ago time. I would like to know something about the history of this location. We stopped for a short look and spent two days exploring. It was beautiful and intriguing and we hope to go back again next year and spend longer. The old road and Saskatchewan glacier hut was built by U.S. Army’s 87th division which used to test vehicles over snow and ice in 1930 – 40s. The original building collapsed during 1940s. Canadian Army Engineers rebuilt it and used for training Lovat Scouts. After that, it was turned over to Alpine Club of Canada. The hut was located on the south bank of the stream originating from the Glacier. The road that led to the hut was washed away by floods. After it was rarely used. Thank you so much for the information/ I am going to order the Summits and Icefields book. There is so much beauty and history to learn about our corner of the world I don’t know why people travel elsewhere.